Monoclonal gammopathy of undetermined significance does not have end organ damage, but a proportion of cases manifest with renal injury when it is called monoclonal gammopathy of renal significance (MGRS). Herein, we describe a case of acute hepatitis E infection, which precipitated the development of MGRS. The patient underwent kidney biopsy for elevated creatinine with clinical suspicion of drug-induced interstitial nephritis. On light microscopy, there were periodic acid–Schiff negative-fractured casts in tubules with giant cell reaction around them. The tubular epithelial cells showed intracytoplasmic bile pigment. On direct immunofluorescence, casts showed kappa restriction. A diagnosis of bilirubin proximal tubulopathy and light chain cast nephropathy was made, and possibility of myeloma was suggested. On further evaluation, κ:λ ratio was 27, β2 microglobulin was 8036 ng/ml, and bone marrow examination showed 5% plasma cells. There were no bony lesions, and serum calcium was 8.6 mg/dl. The present case is unique in two aspects. First, the patient developed MGRS triggered by acute hepatitis E in less than a month. Second, the MGRS lesion was manifested in the form of light chain cast nephropathy. The spectrum of plasma cell dyscrasias ranges from monoclonal gammopathy of undetermined significance (MGUS) to smoldering myeloma and frank multiple myeloma. Although majority of MGUS cases do not have any end organ damage, a proportion of cases can manifest with renal injury when it is called monoclonal gammopathy of renal significance (MGRS). It is essential to recognize MGRS, to initiate early treatment, and to prevent irreversible damage to the kidney. Herein, we describe a case of acute hepatitis E infection precipitating MGRS. A 39-year-old female without any previous comorbidities, presented with acute cholestatic hepatitis. On evaluation, she had leukocytosis, conjugated hyperbilirubinemia (total bilirubin 32 mg/dl and direct bilirubin 20 mg/dl), elevated liver enzymes, normal coagulogram, positive IgM anti-hepatitis E antibody, and normal renal function tests. Initially, she was managed conservatively with paracetamol, antiemetics, proton-pump inhibitors, and ursodeoxycholic acid. She continued to have jaundice and constitutional symptoms lasting more than 1 month. Her jaundice gradually improved, but she started developing symptoms of nausea, vomiting, loss of appetite, and loss of weight. On evaluation, this time, the laboratory investigations showed a normal liver function (total bilirubin of 0.6 mg/dl, aspartate aminotransferase 21 IU/dl, alanine aminotransferase 20 IU/dl, and alkaline phosphatase 145 IU/dl), but deranged renal function (serum creatinine 5.5 mg/dl), urine examination showing albumin 1+ and pus cells 8–10/hpf, 24-h urine protein 0.91 g, hepatitis B surface antigen and anti-HCV negative, ultrasound of hepatobiliary tree was unremarkable, and ultrasound kidney, ureter, and bladder showed normal-sized kidneys. Renal biopsy was done with provisional diagnosis of rapidly progressive renal failure possibly drug-induced acute interstitial nephritis. Kidney biopsy showed periodic acid-Schiff negative-fractured casts in the tubules with giant cell reaction around them. The tubular epithelial cells showed cytoplasmic vacuolization and bile pigment. 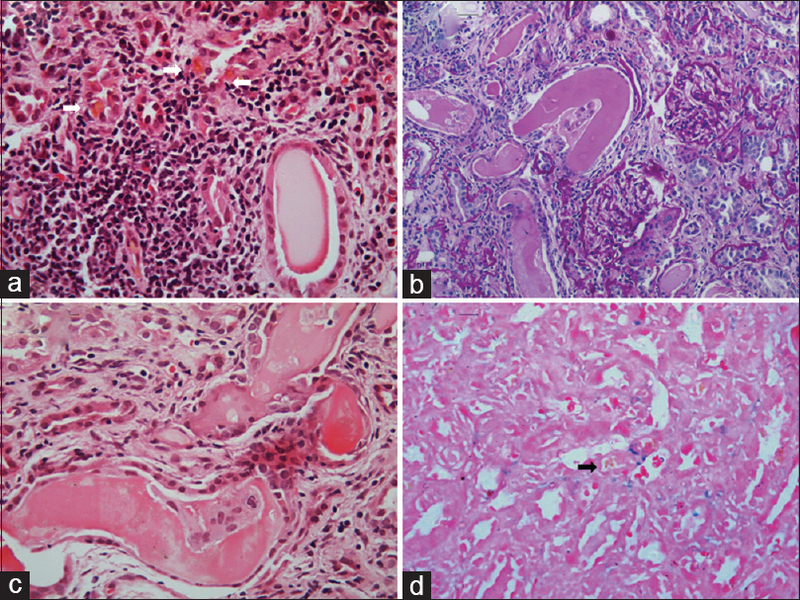 Interstitial fibrosis tubular atrophy was about 40%, and mild patchy interstitial edema and lymphocytic infiltrate were noted [Figure 1]a, [Figure 1]b, [Figure 1]c, [Figure 1]d. Glomerulus did not show any diagnostic abnormality. On direct immunofluorescence, the casts showed kappa restriction. No glomerular or tubular basement membrane positivity was noted [Figure 2]a and [Figure 2]b. A diagnosis of light chain cast nephropathy and bilirubin proximal tubulopathy was made, and a possibility of monoclonal gammopathy was kept taking into consideration the typical morphology of the casts and kappa restriction. Subsequently, laboratory investigations revealed no M band on serum protein electrophoresis; however, serum immunofixation showed a faint band in gamma region. On serum-free light chain assay, the κ:λ ratio was 27 (732 mg/L:27 mg/L). β2 microglobulin was 8036 ng/ml. Bone marrow examination showed 5% plasma cells. On skeletal survey, there were no bony lesions and serum calcium was 8.6 mg/dl. Hematology consultation was taken, and the patient was administered 6 cycles of cyclophosphamide/bortezomib/dexamethasone regimen for MGRS. After completion of chemotherapy, her serum creatinine improved to 1.95 mg/dl and κ:λ ratio was 6.9 (176 mg/L:25.8 mg/L). MGRS is a form of renal injury caused either directly or indirectly by monoclonal immunoglobulins produced by nonneoplastic clones of plasma cells. For example, only about 8% of amyloid light-chain (AL) amyloidosis cases and about 20% monoclonal immunoglobulin deposition disease cases have symptomatic multiple myeloma at presentation. Most cases of MGRS have a hematologic abnormality consistent with MGUS (serum monoclonal M protein <3 g/dl and bone marrow plasma cells <10%). By definition, patients with MGUS lack end organ damage (anemia, lytic bone lesion, hypercalcemia, and renal dysfunction); however, a subset of MGUS cases may develop renal impairment often associated with high morbidity. Therefore, the term MGRS was coined in 2012 to differentiate these cases of monoclonal gammopathy from MGUS. The most common extrahepatic manifestation of hepatitis E infection is neurological disorder, occurring in about 5.5% of cases, which includes meningoencephalitis, transverse myelitis, neuropathy, Guillain–Barre syndrome, and Bell's palsy. Other rarer manifestations are rheumatological (arthralgia, myalgia, and skin rash), renal (IgA nephropathy and cryoglobulinemic glomerulonephritis), and acute pancreatitis. The present case is unique in two aspects. First, the patient developed MGRS triggered by acute hepatitis E in less than a month. MGUS has been described in about 26% cases (17/65) of hepatitis E infection by Woolson et al. In six patients, serum protein electrophoresis was available after a median interval of 44.5 months, out of which three patients no more had monoclonal paraproteins and two patients had persistently elevated monoclonal paraproteins without end organ damage. Serum protein electrophoresis was not done before hepatitis E infection in any of the 65 patients; therefore, it is unclear whether MGUS was precipitated by hepatitis E infection or immune deficiency associated with MGUS led to hepatitis E infection. However, host immune response stimulated increased production of gammaglobulins, including monoclonal paraprotein secreted by nonneoplastic clone of plasma cells would be the plausible explanation for hepatitis E-precipitated MGUS. Second, the MGRS lesion was manifested in the form of light chain cast nephropathy. Invariably, all MGRS cases have a low monoclonal immunoglobulin burden and therefore manifest in the form of glomerular lesions such as AL amyloidosis, immunotactoid glomerulonephritis, type I cryoglobulinemic glomerulonephritis, monoclonal immunoglobulin deposition disease, proliferative glomerulonephritis with monoclonal IgG deposits, and C3 glomerulopathy with monoclonal gammopathy. Tubular lesions such as light chain Fanconi's syndrome, proximal tubulopathy without crystals, and crystal-storing histiocytosis are less common as compared to glomerular lesions named above as they require high monoclonal immunoglobulin levels. Herein, we report the first case in English literature of hepatitis E-triggered MGRS manifesting as light chain cast nephropathy. Other causes of myeloma light chain-like casts are rapamycin and IVIg administration (polyclonal light chain casts), which were not used for treatment in the present case. The indication for initiation of chemotherapeutic regimen in plasma cell dyscrasias is the presence of end organ damage. Cytotoxic therapy is therefore withheld in MGUS cases as there is no end organ damage., Despite the absence of a high tumor burden, MGRS is associated with significant morbidity and mortality. The administration of cytotoxic therapy to MGRS patients has a favorable impact on renal and patient survival as it decreases the production of nephrotoxic monoclonal immunoglobulins as shown in the present case.,,, Therefore, early recognition and prompt treatment of MGRS is essential for a good prognosis. Bridoux F, Leung N, Hutchison CA, Touchard G, Sethi S, Fermand JP, et al. Diagnosis of monoclonal gammopathy of renal significance. Kidney Int 2015;87:698-711. Kourelis TV, Kumar SK, Gertz MA, Lacy MQ, Buadi FK, Hayman SR, et al. Coexistent multiple myeloma or increased bone marrow plasma cells define equally high-risk populations in patients with immunoglobulin light chain amyloidosis. J Clin Oncol 2013;31:4319-24. Nasr SH, Valeri AM, Cornell LD, Fidler ME, Sethi S, D'Agati VD, et al. Renal monoclonal immunoglobulin deposition disease: A report of 64 patients from a single institution. Clin J Am Soc Nephrol 2012;7:231-9. Leung N, Bridoux F, Hutchison CA, Nasr SH, Cockwell P, Fermand JP, et al. Monoclonal gammopathy of renal significance: When MGUS is no longer undetermined or insignificant. Blood 2012;120:4292-5. Guerra JA, Kampa KC, Morsoletto DG, Junior AP, Ivantes CA. Hepatitis E: A literature review. J Clin Transl Hepatol 2017;5:376-83. Woolson KL, Forbes A, Vine L, Beynon L, McElhinney L, Panayi V, et al. Extra-hepatic manifestations of autochthonous hepatitis E infection. Aliment Pharmacol Ther 2014;40:1282-91. Smith KD, Wrenshall LE, Nicosia RF, Pichler R, Marsh CL, Alpers CE, et al. Delayed graft function and cast nephropathy associated with tacrolimus plus rapamycin use. J Am Soc Nephrol 2003;14:1037-45. Kyle RA, Durie BG, Rajkumar SV, Landgren O, Blade J, Merlini G, et al. Monoclonal gammopathy of undetermined significance (MGUS) and smoldering (asymptomatic) multiple myeloma: IMWG consensus perspectives risk factors for progression and guidelines for monitoring and management. Leukemia 2010;24:1121-7. Pozzi C, D'Amico M, Fogazzi GB, Curioni S, Ferrario F, Pasquali S, et al. Light chain deposition disease with renal involvement: Clinical characteristics and prognostic factors. Am J Kidney Dis 2003;42:1154-63. Leung N, Dispenzieri A, Fervenza FC, Lacy MQ, Villicana R, Cavalcante JL, et al. Renal response after high-dose melphalan and stem cell transplantation is a favorable marker in patients with primary systemic amyloidosis. Am J Kidney Dis 2005;46:270-7. Lorenz EC, Gertz MA, Fervenza FC, Dispenzieri A, Lacy MQ, Hayman SR, et al. Long-term outcome of autologous stem cell transplantation in light chain deposition disease. Nephrol Dial Transplant 2008;23:2052-7. Bridoux F, Hugue V, Coldefy O, Goujon JM, Bauwens M, Sechet A, et al. Fibrillary glomerulonephritis and immunotactoid (microtubular) glomerulopathy are associated with distinct immunologic features. Kidney Int 2002;62:1764-75. Guiard E, Karras A, Plaisier E, Duong Van Huyen JP, Fakhouri F, Rougier JP, et al. Patterns of noncryoglobulinemic glomerulonephritis with monoclonal Ig deposits: Correlation with IgG subclass and response to rituximab. Clin J Am Soc Nephrol 2011;6:1609-16.